On a snowy Friday, March morning, I set out on my journey to visit the Museum of Indian Arts & Laboratory of Anthropology in Santa Fe and the Indian Pueblo Cultural Center in Albuquerque. Julia Clifton is the Curator of Archaeological Research Collections in Santa Fe. The state’s repository facility is off site from the museum. The research center conducts archaeological research projects throughout the state of New Mexico. Their mission is to identify, interpret, and share information about prehistoric and historic sites across the state. The office serves state agencies and private organizations that need archaeological studies performed as part of their development projects. In addition, they provide ethnographic and historical research services and have an award-winning education outreach program. taken on a tour of the facility: storage rooms, work rooms, and laboratory where radiocarbon dating is conducted. I was privileged to have the innovative carbon dating process that is conducted by Dr. Marvin Rowe explained to me. I found this to be very fascinating and I would say the best part of the visit. I have a complete journey of a vessel from a field site to the museum. I am very fortunate to have meet several people who work at the Laboratory of Anthropology, they do great work and are very dedicated to the research they conduct. At the Indian Pueblo Cultural Center in Albuquerque I had the privilege of having Amy Cisneros the Collections Management Specialist be my tour guide of the center. Amy has worked for the Indian Pueblo Cultural Center for fifteen years. The Indian Pueblo Cultural Center is the place to discover the history, culture, and art of the 19 Pueblos of New Mexico. The museum has a permanent exhibit, “We Are of This Place: The Pueblo Story,” this exhibit highlights the Pueblo’s legacy of resilience, telling their story in the words and voices of the Pueblo people. The design of the exhibits is inspired by traditions that have been passed down for generations. In the South Gallery, they have rotating exhibits. 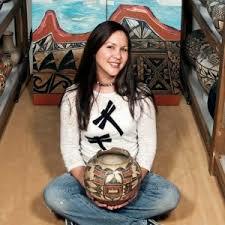 Currently on exhibit is contemporary painter Marla Allison of Laguna Pueblo. I highly recommend a trip to visit the Indian Pueblo Cultural Center in Albuquerque. Marla Allison’s exhibition will be on display until June. You can have breakfast, lunch, or dinner at the Pueblo Harvest Café located inside the cultural center. The period names in classifying pottery have very little to do with the pottery itself. Instead the names refer to cultural changes based on migration and developments in agricultural techniques and architecture. The museum has vessels from Pueblo III, Pueblo IV, Historic, and Modern eras. Our oldest artifact on exhibit is the Western Mesa Verde bowl, the estimated date is c. 1250 to 1350. After 1600 pottery became less important to the native economy so smaller quantities were made. Pottery from the Historic period are the rarest of all. The museum has five vessels during this date range of 1600-1880. Stop in for a visit and see if you can find these five pots that are on display in the Mezzanine Level. The signature by potters on their vessels is almost universal today. Before 1940 many potters did not speak English, and very few wrote it. If a potter’s name was written on the bottom of an old pot it was more than likely written by the trader who sold it or by the buyer. Pots that were made from the 1930s to the 1950s had crude signature’s that dealers often call “graffito” (An ancient drawing or writing scratched on a wall or other surface.) Acoma potters once believed that signing their work was an inappropriate expression of ego. Potter Maria Martinez of San Ildefonso began signing her pottery in the mid-1920s. Santa Clara, Acoma, and Laguna followed soon after. Bottom collectors buy pots for the signature on the vessel rather than for the pot itself. Golden Bottoms are pots that have been signed by the following famous potters: Maria & Julian Martinez, Fannie Nampeyo, Lucy Lewis, Lela & Van Gutierrez, Rose Gonzales, and Marie Chino (Hayes & Blom, 1996). The Luther Bean Museum has two Golden Bottoms! These pots are by potters Maria & Julian Martinez and Lela & Van Gutierrez. I invite you to stop by this Spring Break and see the wonderful collection of artifacts on display. Enjoy. Katyete or Ko-Chits (Cochiti) Pueblo “The Stone Kiva” are located in north-central New Mexico; 25 miles southwest of Santa Fe. The pueblo’s of the Cochiti and Santo Dominog are the most northern of the Keresan language. Some experts believe that the Cochiti originally came from Tyuonyi, an Anasazi village located in the Jemez Mountains. Later migrating to their present location (Hayes & Blom, 1996). Cochiti and Santo Domingo developed their pottery on a parallel course around the 1830s. It was around 1850 that the Cochiti were known for their own distinctive style. Cochiti Polychrome pottery contain images of sacred symbols such as clouds, rain , lightening, serpents, mammals, and even humans (Harlow, 1977). The Cochiti also produce ceramic animal figures such as owls, coyotes, bears, and turtles. One of the most popular figurines originating form the Cochiti is the storyteller, which was made famous by the late Helen Cordero. Today the potters from the Cochiti pueblo make an enormous variety of people and animals as storytellers. (Gibson 2001). Gibson, Daniel. Pueblos of the Rio Grande: A Visitors Guide. Rio Nuevo Publishers. 2001. The Hopituh (Hopi) means “the Peaceful People”. The Hopi reservation is located in a remote area northeast of Flagstaff, AZ.They have lived in this area for over a thousand years. The reservation consist of three mesas, which protected the Hopi from invaders. Today there are twelve Hopi villages that are located at the base of the three mesas known as First, Second, and Third Mesa (The Hopi Tribe, 2005). 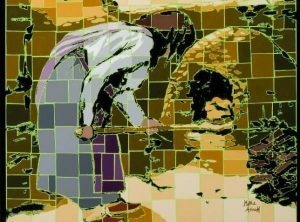 The villages of the First Mesa have dominated Hopi pottery making since the late 1800s. The Hopi assimilated European pottery forms in their own designs; they imitated the ring based shallow bowls and the flare-rimmed bowls (Allen, 1984). Allen, Laura Graves. Contemporary Hopi Pottery. Museum of Northern Arizona. 1984. The Hopi Tribe. History of the Hopi Tribe. 2005. Web accessed March 2017. This Spring Break I will be taking a road trip to Santa Fe and Albuquerque. My visits will be to the Museum of Indian Arts & Culture/ Laboratory of Anthropology and the Indian Pueblo Cultural Center. At both locations I will be visiting with the curators and taking a private tour of the center. I am looking forward to my trip and sharing my stories with you.